What’s the saying about March? In like a lion, out like a lamb? In this March recap episode, we’re talking about a month that was way more lamb than lion. Let’s do it. Coming off the heels of an outstanding February, I wasn’t quite sure what to expect for March. All in all, March was a pretty solid month, and it was definitely all about doing the work. Oddly enough, I had high expectations for March and low ones for February, so the universe is keeping me on my toes! Let’s dive into the month that was. The theme for March with Scoop Studios was doing the work. We booked a lot of new clients in February, which meant a lot of deliverables in March. It was a good solid pace of work — and I even took a week off with my family. Honestly, after the February we had, I was okay with a month that didn’t have so much new business. We did have a few new leads roll in, and most of those proposals are in the decision making phase. What’s been interesting to me is how with an increase in new business, I’ve become very comfortable with charging more for certain services which means budget is a concern for potential clients. So, it’s a lot of waiting for yeses (and following up!) while continuing on with generating new leads. We’ve got solid possibilities as we go into Q2, and with the real focus being on profit and enjoying what we’re doing, we’re right on the mark. For April, I really want to firm up a couple of our project clients into ongoing retainers — and we’re very close — so now it’s a matter of doing what needs to be done to make that happen. I will say, I feel good about the type of clients we’ve attracted and the work we’re doing, and in an unexpected way, it’s resulted in way more freedom for me personally as corporate clients don’t move nearly as fast as small businesses do. Q2, in general, is really about staying the course and managing through a two-week trip I’m taking with my family in May. I’m mindful of not taking on too much before then and setting that time away up for success. I’m actually thinking of my quarter in two phases to help deal with that. Team-wise, we’ve been working to shift the workload around a bit more so everyone is on the right tasks and projects, and we’ll continue to play with this. A lot of that has come down to figuring out how to streamline specific systems, reduce the back and forth, and keeping me out of things I don’t need to be involved in. 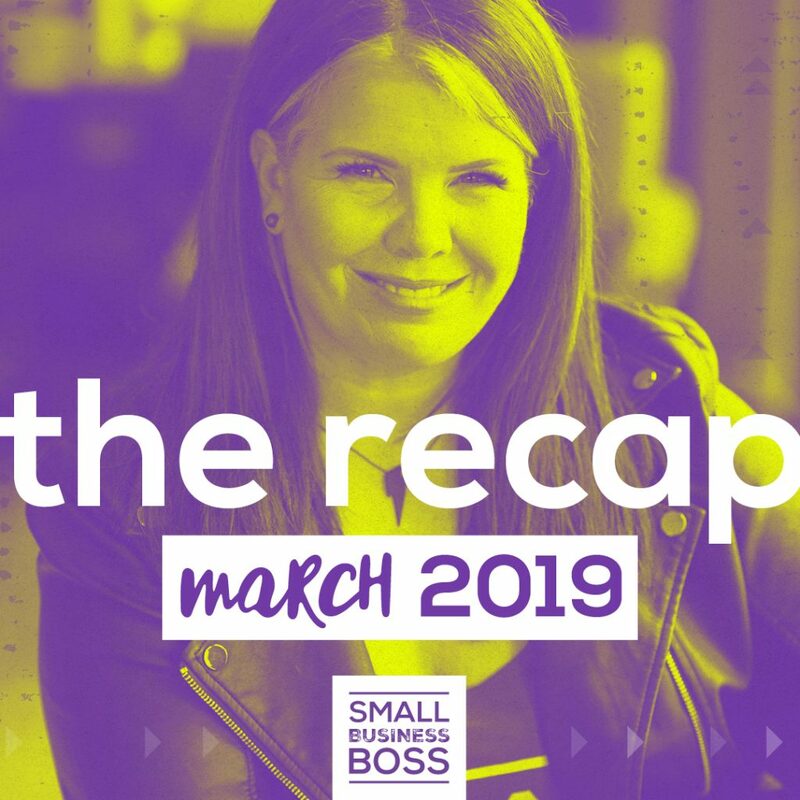 March was very much internally focused for Small Business Boss as I focused on creating the new flagship course for the Society, Client Alchemy, and promoting the Small Business Boss Summit. The course on finding clients is set to roll out in April, and I’m thrilled with how it’s all come together. It is taking me a bit longer than expected, but I decided we’re not going to launch the Society until the Fall, so there’s no rush from that point of view. Deciding not to launch was a tough call, but I have a lot of thoughts about running a membership community, in general, and I want to re-engineer it in the coming months. I know what works, but there are certain aspects of this business model I quite frankly don’t like (like member churn). There’s a better way, and I’m going to find something that works better for us and lets us serve a broader audience. Speaking of a broader audience, get ready for some real talk. Selling tickets for the Small Business Boss Summit has been about 100x harder than I thought it would be. We’re not close to the goal I have for early April at this point, and I’m hustling to try to pull this off. Decisions will have to be made if things don’t pick up quickly….stay tuned! No matter what, there are definitely going to be big old lessons learned with this event — and that’s all part of the journey. In March, I decided I need to do more writing on what I’m learning and experiencing, so those are being published on the SBB website, and I’m also talking about them over on Instagram. The first post looked at the lies within the online business world — which there are so many. And it’s a big reason I just came clean with you on the Small Business Boss Summit ticket sales; you don’t need more glossy updates that are full of it.